So you’ve made the switch to the Safari web browser; congrats! But what about your bookmarks? If you have a rather large list of bookmarked websites then you’ll need to import them! 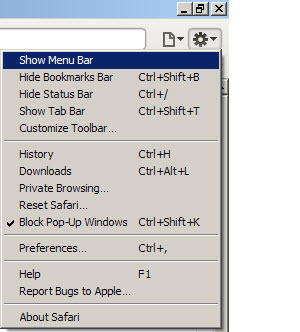 The following method demonstrates how to export your bookmarks from Firefox and import them using Safari. The first step requires you to export your bookmarks from Firefox. Fortunately this is fairly simple process. 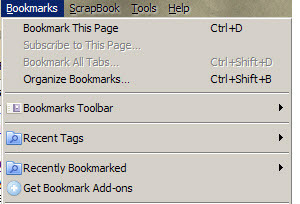 Simply select the Bookmarks menu item, then select “Organize Bookmarks”. Next select the “Import and Backup” dropdown and select “Export HTML”. When prompted, save this file to your hard drive (desktop is fine for now). That’s it! You’ve successfully exported your bookmarks from Firefox to a standard .html file. Next we need to import this file back into Safari. Now for me, the primary menu toolbar wasn’t enabled and I don’t believe it’s enabled by default. If you can’t see menu bar with “File”, “Edit”, “View” etc, then you’ll need to enable this menu bar. You can do this by selecting the cog menu icon on the right of the browser, and selecting “Show Menu Bar”. Once you’ve got the menu bar activated, simply select “File” then “Import Bookmarks” and browse to your desktop where you saved the Firefox bookmark export! That’s it! 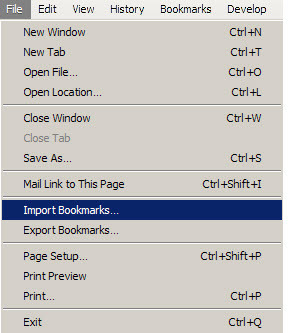 You’ve successfully imported your bookmarks from Firefox. You can now drop and drag your bookmarks to your preference! I dragged my most used bookmarks to the “Bookmark Bar” in Safari which allows me to quickly access the bookmarks I used most.